This pork and black beans stew is usually served with basmati rice, cabbage, sliced orange, vinaigrette and toasted manioc flour, depending on the location. Feijoada is originally a Portuguese name for bean stew, but it is said that the origin of the Brazilian Feijoada is from the times when slaves were brought from Africa to work in the Brazilian farms. Slaves needed to be kept strong and full of energy to be able work hard and there was no better protein rich ingredient to do this than beans and meat. Slaves were not given the best pieces of meat, despite this it must have been a very savoury dish because of the cook’s multicultural influence. Chop all the pork parts, sausages, onion and garlic. Keep separately. Use the garlic and lemon juice to marinate the fresh parts such as steak or ribs. Fry the onion with the pancetta until both are golden. Add the pork, stir until cooked, and then add the smoked pork, the smoked sausage and the chorizo. By adding each ingredient one by one they keep their own flavours. Finely chop the garlic and the cabbage. Fry the chopped garlic in olive oil. Add the cabbage and a pinch of salt. Cook while stirring for 2 minutes. Add the beans, the bay leaves and hot water until all the ingredients are completely covered. Cook uncovered for at least 25 min, but the longer the better. Stir often and add hot water if needed. For the vinaigrette, finely chop the onion and tomatoes and mix with a pinch of salt, vinegar and olive oil. Serve the dish with freshly cooked basmati rice. Débora Locatelli has, despite her Italian name, Brazilian origins. Her passion for cooking increased when she moved to Dublin, Ireland. She describes Dublin as beautiful city, full of new flavours and tastes. 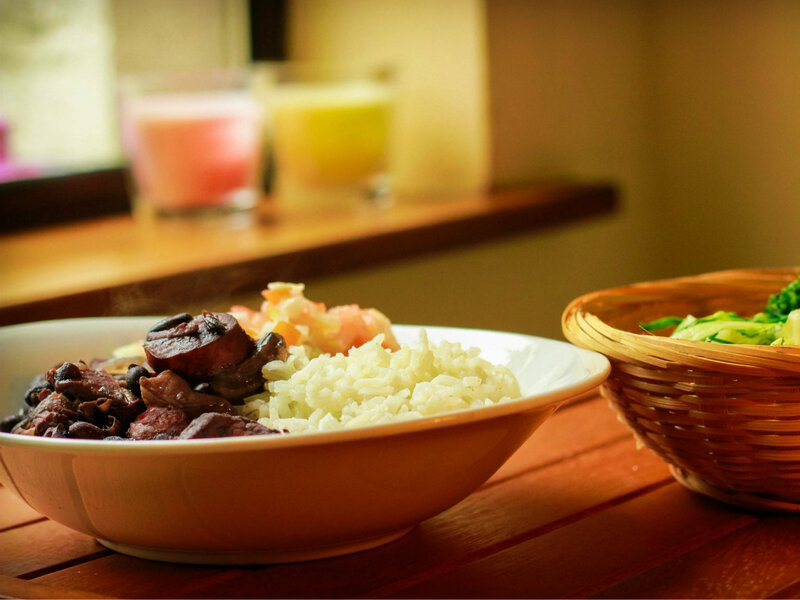 Preparing familiar Brazilian food is her way of avoiding homesickness.